We received two other chimes from the same company as a gift months ago. We get lots of high winds here in the desert, but so far no problems with breakage. They are tougher than they appear to be. The finish is very high quality, no rough edges. Colors very sharp and realistic looking. The cording is high-test nylon, so stands up to the elements and UV rays well. The tones vary by chime, and the shape, thickness of each piece, but very pleasant, and rich sounding. I bought these windchimes after months of searching. I come from a slightly superstitious family who has come to believe metal windchimes bring bad luck if hung outside. It is nearly impossible to find elegant windchimes made from other materials, or so I thought. I have had these windchimes for about 6 months now and I love them more and more each day. Unlike other reviewers I have had no trouble with the quality of these chimes. I just received my Merlot wind chimes. I am very pleased with them. They are very attractive and have a pleasant sound. They will look great and natural outside amongst our trees. I thought the picture looked like the leaves had more color than what they actually do, however, I am still pleased with it. Overall all, I am very satisfied with my purchase. Also, they were packaged so adequately. You could definetley tell the company took care in making sure the product was delivered in good condition with no breaks!!! Way to go! 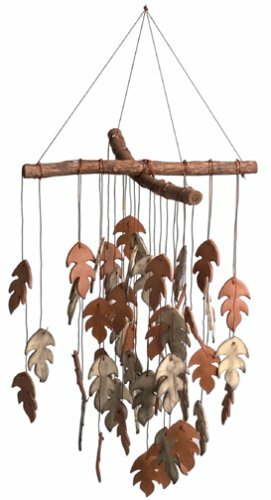 I ordered this windchime as a gift for a client of mine. While I never actually saw the windchimes, my client has told me numerous times how much she loves them. She said they are beautifully made and look wonderful hanging on her porch. This is one of the most beautiful looking set of wind chimes I've seen. It looks far more fragile than it is, but I still wouldn't put it in too windy of an area. But what it has in beauty, it lacks in tone. It sounds rather clanky -- not soothing at all. And that's another good reason not to put it someplace that's too windy! It really looks lovely in the small courtyard at my front door. I have it hung fairly close to the door at the back of the courtyard. I have better sounding, but not as lovely, wind chimes at the front where the wind goes by. Chimes are chimes. Not so! This particular set of magical chimes was sent to dear friends because of their unique qualities. The chimes that is! Very well received and that's cool. Caramba's "Lost in Thought Feng Shui Chimes" are as artistic as they are melodic. I hung them indoors as I live in an apartment; and they bring the charm of a summer's afternoon right into the house. There is usually a small fan blowing in the room and the chimes inject soothing tones into the breeze. The were a little cumbersome to unwrap and hang, but truly worth the effort once the job was complete. They are like nothing else I have ever seen and have brought serenety into my living space. This was sent well packaged, and protected from breakage. I followed the unpacking directions, and it still took me an hour to untangle all the strings. Once done, it has a beautiful look and sound. It is much longer than I visualized, which makes it more dramatic looking. One of the best-well-made wind chimes made! This windchime was so beautifully and carefully packaged, wrapped in paper and enclosed in a heavy outer wrap with label and tag. The sound of this windchime is incredible, beautiful, I just love it. It looks pretty hanging under my tree in the garden. Even the wood on the top of the windchime is rustic. Every leaf was wrapped in foam in the package, it was so protected. It would make a marvelous gift, -- in presentation, packaging, appearance and sound. I highy recommend it. Probably everything Caramba makes will be like this. It is from Peru, a plus,--- makes it more interesting! I bought this for my sister for Christmas. It is beautiful, but don't hang it outside. She put hers outside and it is now in hundreds of pieces. These chimes have a natural look and are very heavy. Unlike many chimes, they also have a beautiful sound. Highly recommended! They are very pretty and make a pretty sound but I have to untangle them every time the wind blows more than 5 mph. some were broken when arrived so they seem to be fragile but withstand wind. I don't have a place to hang these wind chimes outdoors, but they are charming and a serene addition to my bedroom/office. I keep a small fan blowing and the chimes produce the most soothing, melodic tones. Plus they look great! A wonderful gift item, too. I got a similar set of Feng Shui Chimes and I've been a different person ever since. I keep a small fan blowing at them from a distance and their soothing and soft chimes seems to release any tensions that have built up during the day. I love mine - it's beautiful and sounds lovely! It did arrive with some broken leaves, BUT I called the toll free number on the box and they replaced the whole thing for free. They didn't make me return the broken one - they didn't make me pay for reshipping . . . In a day when free returns and free reshipping are almost unheard of, they gave me both! And well worth the phone call to cheerful and helpful Edna! For such an inexpensive item I wasn't going to the trouble of re-packaging. Itself not a minor matter; we ARE talking about wind chimes here.